Have you look at the example Enviro-geotech9? 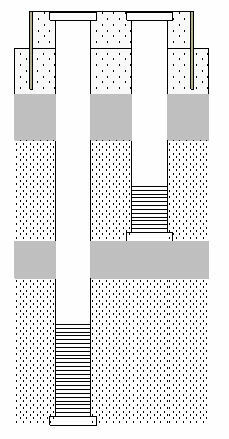 It shows an example of a nested well construction using the offset field. Otherwise please provide a picture or description of what you need. The basic diagram isn't a problem in LogPlot but if you need the additional annotation (dimension arrows and blocks) you'll be better off using a CAD program. Let us know if you have any questions. I'm moving this discussion to the LogPlot section. I asked the question originally because I thought that this must be possible in logplot (to show a nested piezometer installation with the installation materials between the separate PVC pipes). I had tried to work with offsets, which make it possible to show the two pipes, however I could not figure out how to show the installation materials (sand, gravel and bentonite) between the piezometers. If it possible to do this in Logplot, can you please provide instruction or a starting point. I am not concerned about any additional annotation. You'll have better luck if you create your patterns with backgrounds just not-quite-white (e.g. RGB 254 254 254) so that they won't plot as transparent. You also need to be mindful of the order in which the pattern blocks are plotted - the later items are plotted later.